Zionism Unveiled: An American President? Editor's Note: The following is a striking insight into the nationality of President Obama. 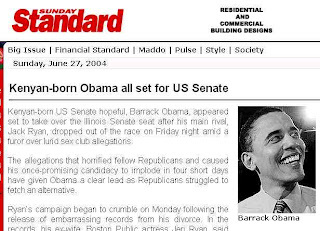 This article was published by a Kenyan news source 5 years ago, shortly before he reached the Senate. Tel. +254 20 3222111, Fax: +254 20 214467, 229218, 218965. News room Tel: +254 20 3222111, Fax: +254 20 213108.